After reviewing the Dell U2412M 24-inch monitor a few weeks back, Dell threw me another premium monitor. The Dell U3011 is a new 30-inch model replacing the U3008WFP. The IPS panel is factory calibrated to sRGB and AdobeRGB modes, so it saves the hassle of re-calibrating. 1. the IPS (in-plane switching) LCD panel that offers minimal colour deviation when you view the screen at varying angles. 2. 117% colour gamut (range of colours), compatible with 100% sRGB and 99% AdobeRGB standards. 3. Capable of displaying 1 billion colours at 1,000:1 (typical) dynamic contrast ratio, 7ms (typical) response time. If your current monitor displays only 1280×800, then the Dell U3011 is 4 times of that resolution! You can tile 4 windows on the monitor and work on all 4 windows at the same time. How useful is that? 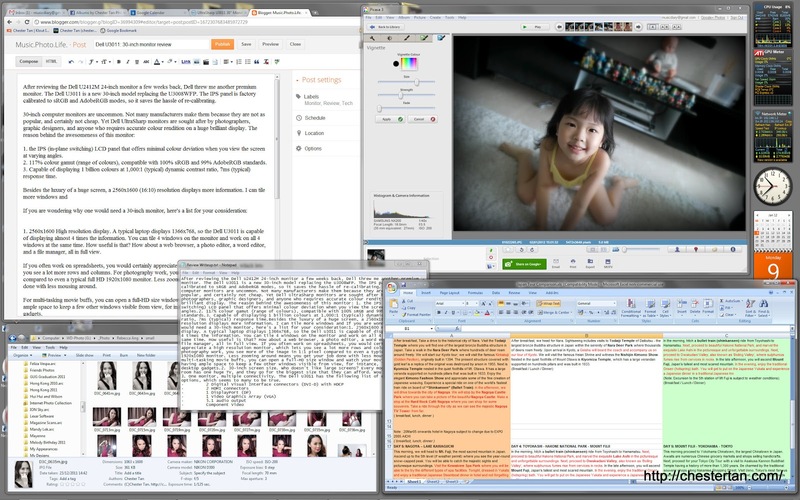 How about a web browser, a photo editor, a word editor, and a file manager, all in full view. 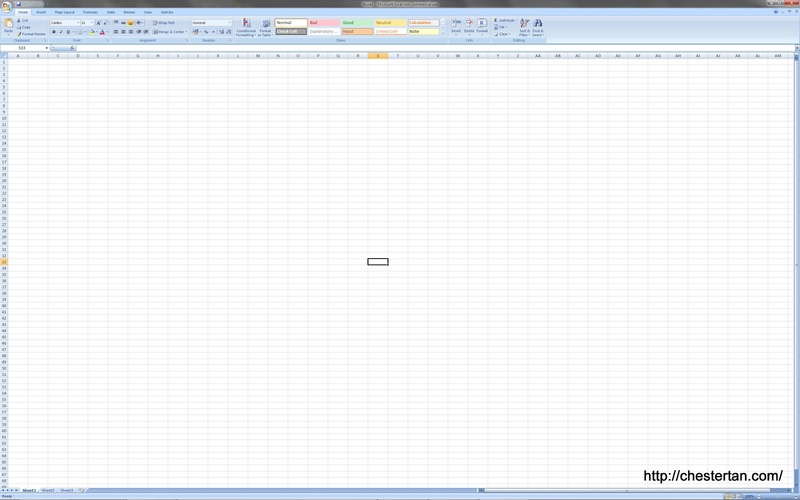 If you often work on spreadsheets, you would certainly appreciate a high resolution monitor, which lets you see a lot more rows and columns. For photography work, you see more of the image in 1:1 pixel compared to even a typical full HD 1920×1080 monitor. Less zooming around means you get your job done with less mousing around. For multi-tasking movie buffs, you can open a full-HD size window and watch your movies while having ample space to keep a few other windows visible from view, for instance, live monitoring desktop gadgets. 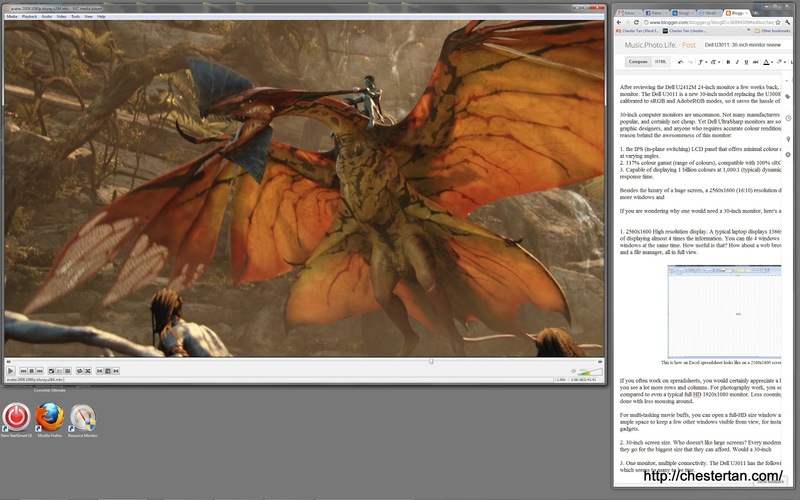 Watching the Avatar movie in full HD while blogging, only possible with Dell U3011. Who doesn’t like large screens? Every modern living room has a huge TV, and people tend to buy the biggest size that they can afford. But would a huge monitor be really necessary for a computer user since one usually sits close to a monitor as compared to watching TV? My computer screen is about 2 feet away from my eyes, and a 30-inch screen is just nice to fill up my field of vision. Having a single high-res screen can be better than multiple screens, because in a multiple-screen setup, you need to turn your heads frequently to look at both monitors. And at 30-inch, the resolution is just nice, not too small unlike laptops with full-HD resolution. Size in perspective: Dell U3011 (right), 24″ Philips 240B (left), and 12.1″ Thinkpad X61. 3. One monitor, multiple connectivity. The Dell U3011 has the following list of connectivity options, which seems to many to be true. So technically you can connect 6 devices to this mammoth monitor and easily toggle among them using the capacitive menu buttons, which is so cool because you activate the buttons by lightly touching, unlike most other monitors which requires you to click on the small rigid poorly-labelled buttons. Bring your finger near to the buttons and the bottom one lights up. Select it and the on-screen menu and all other buttons light up. Use it not just as a computer monitor, but also as a TV to plug your DVD player, your game console, hook it to your 5.1 sound system. 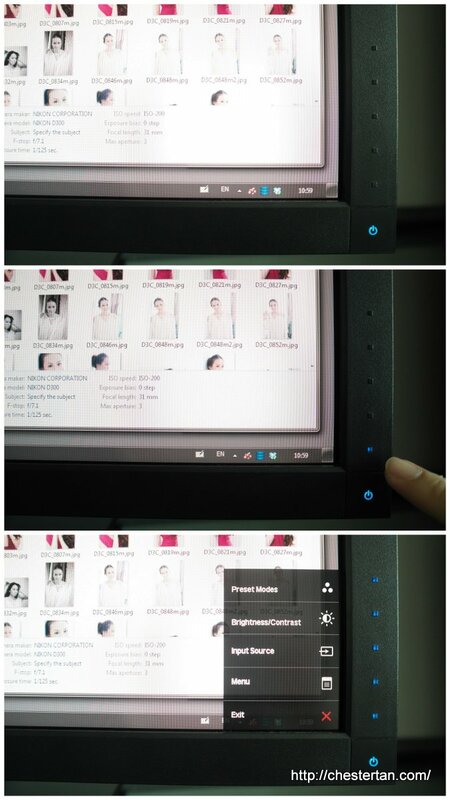 You can slot in your SD cards for file transfer, or easily connect your USB devices to this monitor. For many years, I have evolved my monitor usage behaviour, from a 15-inch monitor, to a 17-inch, then a 19-inch, then I bought a 22-inch and started a 2-monitor extended display setup, then I sold off the 19-inch for the current full-HD 24-inch. I was contemplating getting rid of the 22-inch (WSXGA+, 1680×1050) for the Dell U2412M 24-inch, but now that I reviewed this 30-incher, it appears that I might revert back to a single-display, because there are so much more pixels to offer in a single display that is easier to manage than multiple displays. Of course, there’s no stopping me to buy this and hook it with my existing monitor to increase my desktop size, yet again. There is no end, is there? Before you invest in this beauty, make sure your display card supports the extra-high WQXGA resolution. The standard HDMI cable only supports up to full-HD resolution of 1920×1080, and analogue display (VGA) connection also cannot reach the full native resolution. In my test, only the DVI Dual-link cable delivers the full 2560×1600 resolution. Thanks for the review I'm just waiting for a good price on one of these. That's so much information you can cram into one screen and I think 30" is perfect size for desktop use but could be wider ratio as I will miss eyefinity peripheral vision.